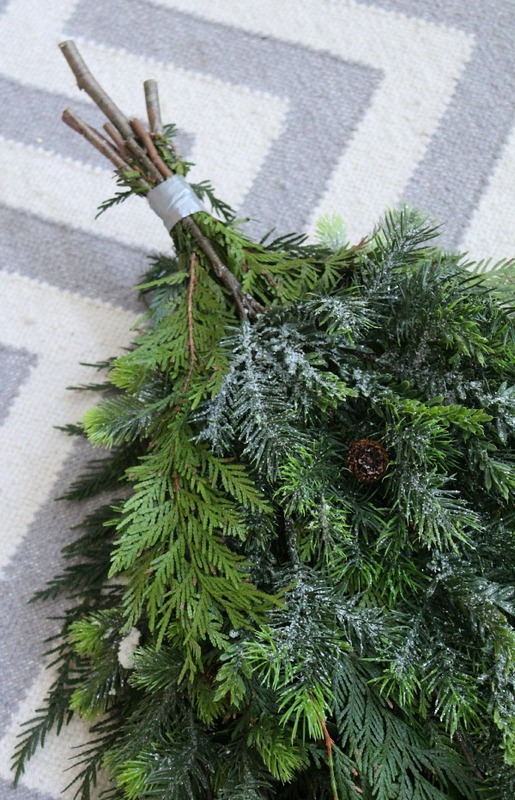 The simple DIY Christmas swag wreath is easy to make using fresh or faux greenery. A nice change from a traditional wreath and perfect to hang on the front door! 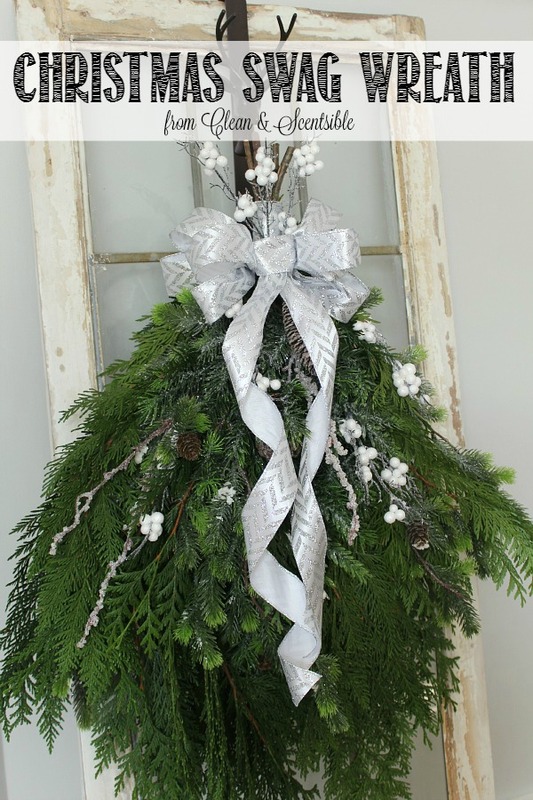 I am going for a rustic Christmas look on our front porch this year and wanted to make a swag wreath using some fresh greenery for our front door. With some cedar clippings from my parents yard, a couple of faux pine branches from Michaels, and a few other odds and ends, I was able to put this wreath together in less than 30 minutes. 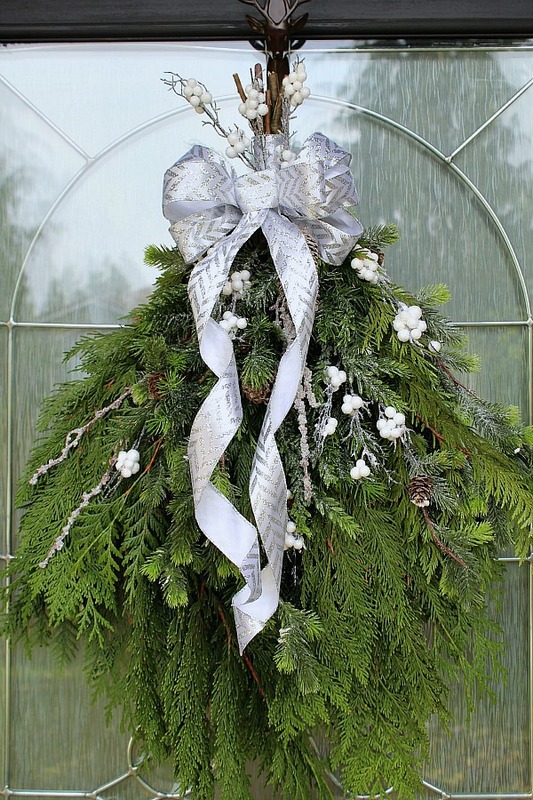 A swag wreath is a fun twist on the traditional Christmas wreath. Keep it loose and full for a rustic look, or use a more structured form for a more formal style. Take all of your greenery and arrange it as you would like. The only fresh greenery that I had was some cedar clippings from my parents’ yard, so I added some faux pine needles to add more depth and texture. As it gets a little closer to Christmas, you can always ask for extra cuttings from Christmas tree farms or other places that sell trees. They are usually happy to give it away. Wrap some duct tape around the top of the branches to hold them all together. Trim down any branches if needed. 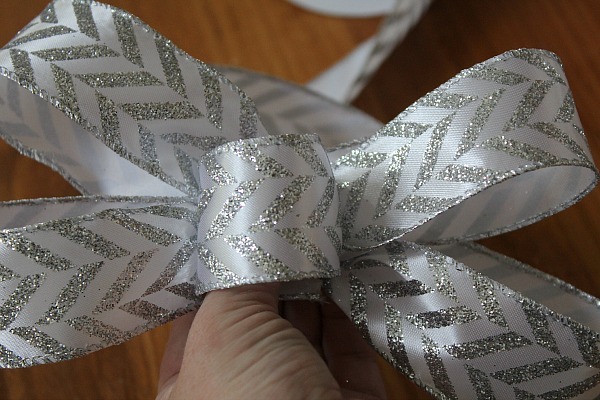 Wrap your ribbon around the duct tape and secure with hot glue or tape. Trim off any stray branches or needles. Make a bow out of ribbon. You can find the full tutorial for how to make a bow out of ribbon like I did for this wreath HERE. 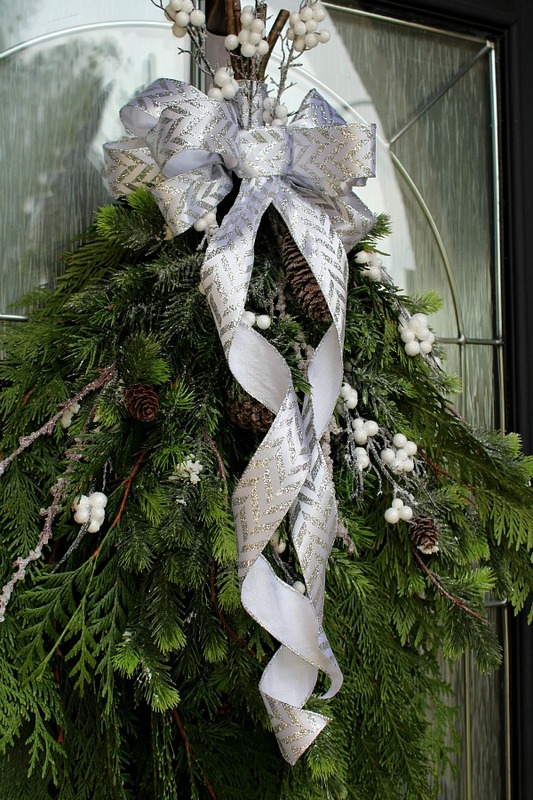 Use a pipe cleaner or floral wire around the back of the ribbon to secure it to your wreath. Now all that is left to do is to secure any extra embellishments that you would like to add. I found this was much easier to do when the wreath was hanging up so I could see where there were any places that needed a little more filling. 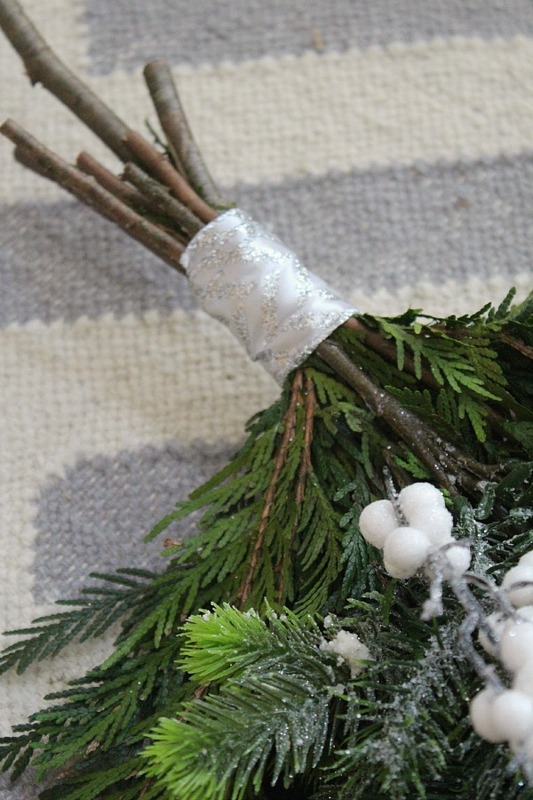 Just take some florist’s wire and tie whatever you are adding to the branches of the wreath. I put in a few berries for now but I still plan to play around with it a little more when I pull out all of my Christmas stash. I’m thinking I might make it a little more snowy looking like I did with these branches last year. 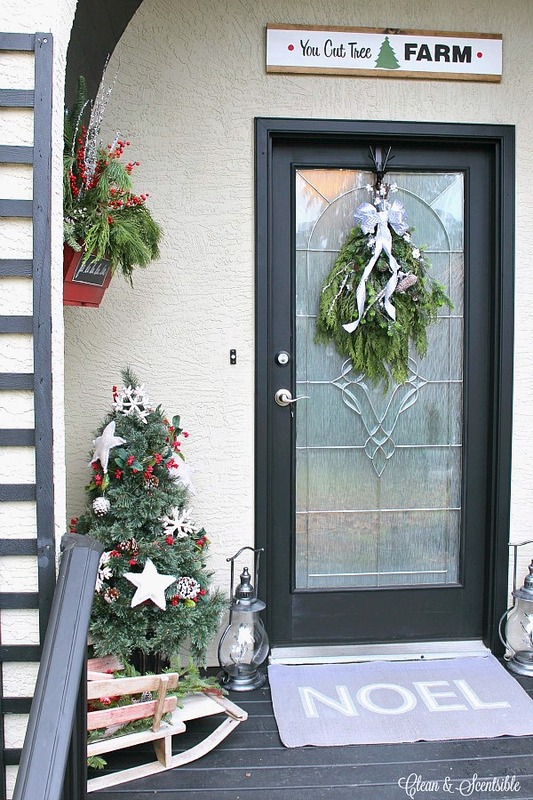 You can find the swag wreath along with the rest of our rustic Christmas front porch over HERE. I hope you’re able to give it a try! They’re so much fun to create and will last you all winter long! I love a good swag, this one is perfect! Thanks for sharing, it’s nice meeting you on this wreath hop! Pinned! So very pretty! I love how you made the bow, and the full greenery swag is so festive. Thanks for sharing! So pretty! I made a swag like this last year (although it wasn’t nearly as glam!) and nearly killed myself trying to get it to hold with just wire. Duct tape is genius!! Thanks so much for the bow tutorial! Seriously I need help with that… Made my own swag and greenery last year but I was seriously lacking in the bow and ribbon department! I’ve always wondered how to make the bows. thanks for tutorial. The swag wreath is beautiful. So pretty! I really love to see fresh evergreens at Christmas – really puts me in the spirit! We don’t get a real tree anymore so it is nice to have some fresh greens elsewhere! Great bow tutorial, and such a pretty festive swag. I love how this swag turned out. It truly is totally my style and it is beautiful. Thank you for sharing your great tips for putting it together! I love this wreath! 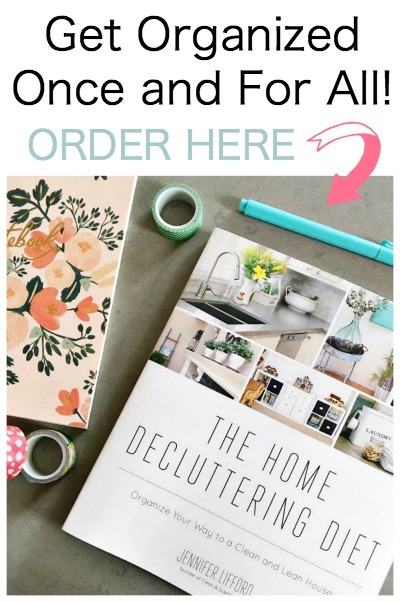 Where was this post when I was making my wreath and realized I can’t make bows?! Lol. Thanks for sharing! I very often make a swag for the front door. Love the tips here for using duct tape to hold it together. In the past, I’ve used an elastic band but it doesn’t always hold up. Great tip! Well done! I love this 🙂 I may have to make this for our banister this upcoming holiday season. Love it! This wreath is so beautiful! Definitely going to attempt to make one this year. Great tips on making the bow. I wondered how to make one so perfectly! !